With about a month left in Pac-12 play for the Oregon Ducks men’s basketball team, Dana Altman and the men in green and yellow understand that they must continue to win games in order to keep their NCAA Tournament hopes alive. The Ducks walked away from Tempe, Arizona last Friday night victorious, and although it was gutsy, a victory is what Oregon needed, and Altman couldn’t have been happier. “It would have been really easy to fold after a bad loss,” Altman said last week. After suffering a 34-point defeat at the hands of the Arizona Wildcats last Wednesday night, which was also Altman’s most lopsided loss at Oregon, the Ducks’ week could have been a disaster. But the mighty Ducks never gave up, and even though it was only their first conference road win of the season, their victory was just another reminder of the incredible job that Altman has done over the years. Oregon’s head coach had tough shoes to fill when he first came to Eugene. Prior to Altman’s arrival, Ernest “Ernie” Kent was the program’s headman. From 1997 to 2010, Kent led the Ducks to the NCAA Tournament five times, which included two Elite Eight appearances, as well. There’s no questioning the impact and the legacy that Kent left on the Ducks’ basketball program, but Altman has taken his job in full stride and he’s added his own flavor. Despite controversy off the basketball floor, and losing multiple players from last season’s roster, you can say that the Ducks have overachieved this season. While many college basketball critics expected the Ducks to be fun to watch, they didn’t believe that Oregon would generate enough wins to make an impact in the Pac-12. Fast-forward to the start of February, and it looks like Oregon will have the last laugh. The Ducks (15-7, 5-4 Pac-12) are currently eight games over .500 and they’re only one game behind the Stanford Cardinal for third place in the Pac-12 standings. But who has been the leader? Who has helped this team overcome adversity? 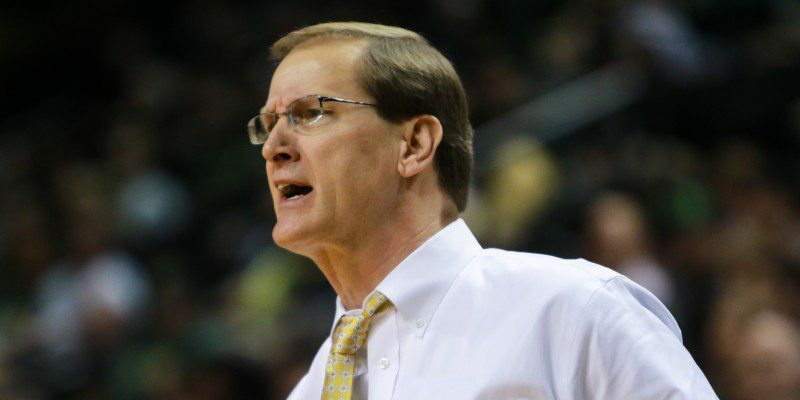 Two words: Dana Altman. The Ducks’ head coach has consistently found ways to succeed, despite having a depleted roster at times, and he has always figured out a way to get the most out his players. Oregon has won a lot of basketball games under Altman, 112 to be exact, but you get the sense that he’s not done yet. When Altman was hired nearly five years ago, he mentioned that the team had a lot of work to do, but he also realized that he could create something special in Eugene. His belief in the team is evident every night, and these young Ducks have responded. It should be an interesting finish.